Save 10% on Amazon for a limited time! Save 10% on Amazon for a limited time only! 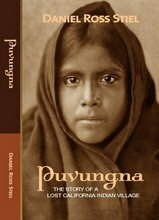 Puvungna is inspired by the true story of a lost village that was once populated by the indigenous Tongva people. You will meet Chinigchinich and the people who called Puvungna their home, and experience how they lived before their land was conquered, their spirituality, and the events that changed a long forgotten history which took place at the village. While little is known about the ancient Tongva people today, the names for many of their villages live on as the names of cities and places across Southern California, including Azusa, Cucamonga, Pacoima, Tujunga, Topanga, Cahuenga, and many others.